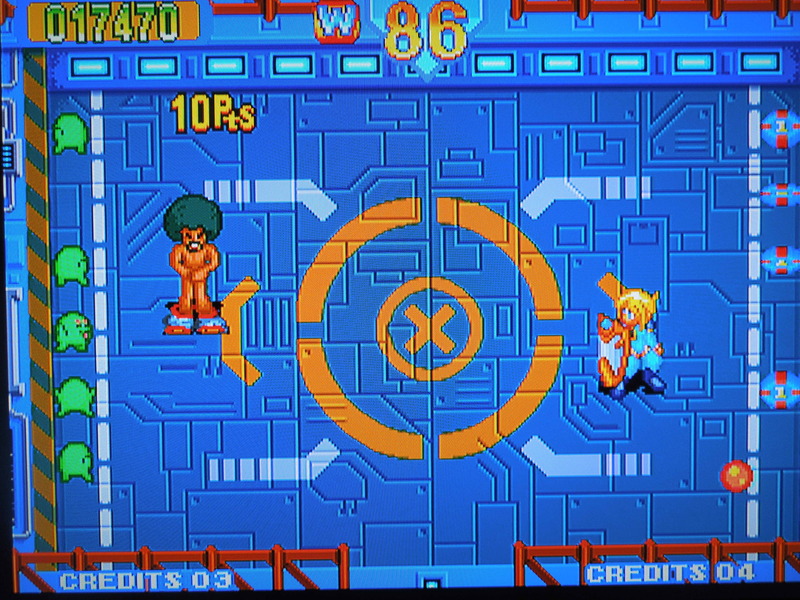 Note 1: This game was played on a Neo Geo AES home console with U.S. settings. The console has been modified to output in component video (red, green, blue). It was connected to a 32-inch HD tv. Note 2: If you’re interested in Neo Geo games, I have already reviewed several others. Check them out! 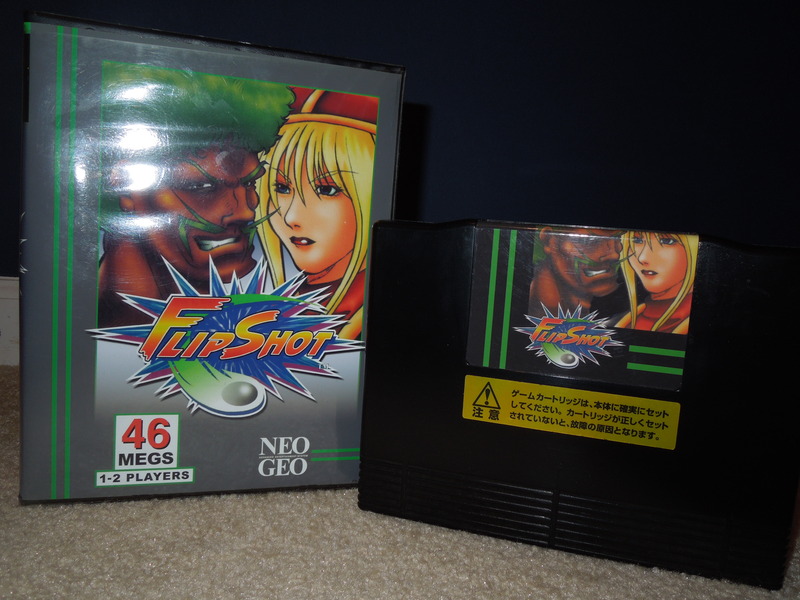 Quick History: Battle Flip Shot, sometimes referred to as just Flip Shot, was released for the Neo Geo MVS arcade cabinet in 1998. The game was never released for the Neo Geo AES home console. Today, however, Neo Geo MVS arcade cartridges can be converted into AES home console cartridges. The Battle Flip Shot cartridge used for this review is an AES conversion. Battle Flip Shot was never released for the AES but conversions now make it possible to play on a home console. Neo Geo Memory Card Support: Yes. If you don’t continue after losing a match (you have 4 Credits, or 4 times to continue), you’ll be asked if you want to save your game. Saving your game will allow you to return to the opponent you last lost to, with the exception of the last boss – if you lose to her and elect either Continue (if you have Credits) or save your game at that point, you’ll be sent back to the opponent you faced just before her. Gameplay: Battle Flip Shot reminded me of Pong, one of the first arcade games ever made, where two players bounced a ball back and forth across the screen, trying not to miss it with their paddle. In Battle Flip Shot, you pick your player (among 5) and play Best of 3 Round matches against all the other characters (including a mirror match vs. your character) and a ‘Boss’ character for a total of 6 matches. During matches, one character occupies half of the screen in one of 6 different arenas. A line down the center separates the sides, and while characters can move wherever they like on their designated side, they cannot cross into their opponents territory. Your objective is to use your character’s shield and bounce and bash a ball across the arena into your opponents territory, trying to hit targets set up along his or her back wall. Your opponent, meanwhile, will try to do the same to you, and you must successfully defend your own targets. Both you and your opponent have 6 targets, and once all 6 have been destroyed by the bouncing ball, you’ll win the round (or lose the round). There is a timer, and if it hits 0 without someone’s targets being destroyed, then the character with the most targets remaining wins. 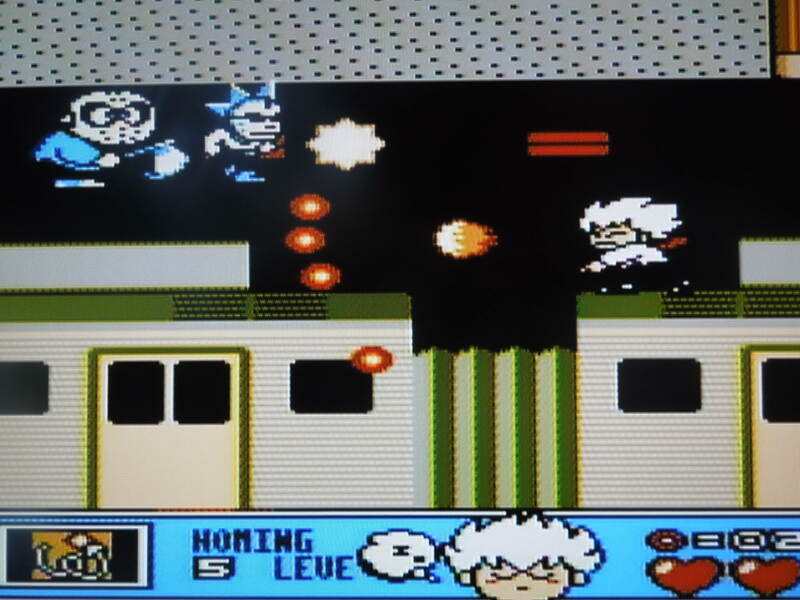 If both characters have the same amount of targets left, then the match is a Draw, and both characters are awarded a win. If you Draw in both Rounds 1 and 2, then the Match is over and you’ll lose a Credit. With 2 players, you can both choose the same character. Characters: 5 interesting looking characters can be chosen: Chinta Nemoto, Siren, Saimon, Bloody Wolf, and Mr. Justice. Siren and Bloody Wolf are female, and the others are male. Each character has a bio that plays during the game’s demo, showing the character’s nationality, job, and what type of ‘power shot’ they use during matches. This information is kind of random and funny – Mr. Justice is an American police officer, and Saimon is a debt collector…ok. Each character appears to move at the same speed during matches from what I can tell, and any differences come from their power shots. In my experience, Mr. Justice’s power shot, the Hard Shot, makes him a good choice because the ball transforms into a huge ball with spikes that can more easily hit targets (I can’t confirm this to be true, but I seem to win more often with him than with other characters, and this is my guess as to the reason why). 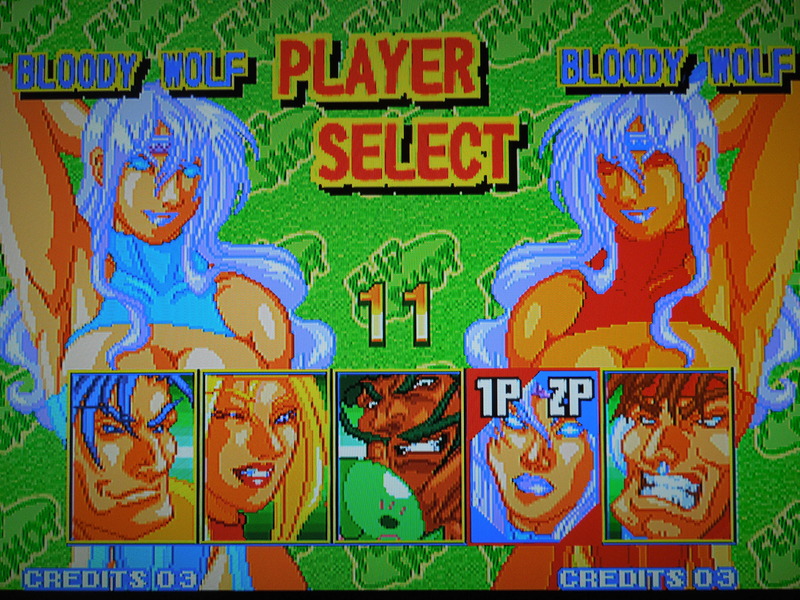 Bloody Wolf is also a good choice, as her power shot allows you to curve (bend) the ball slightly to hit targets – the other characters only hit the ball in a straight line in whatever direction you’re holding the joystick. 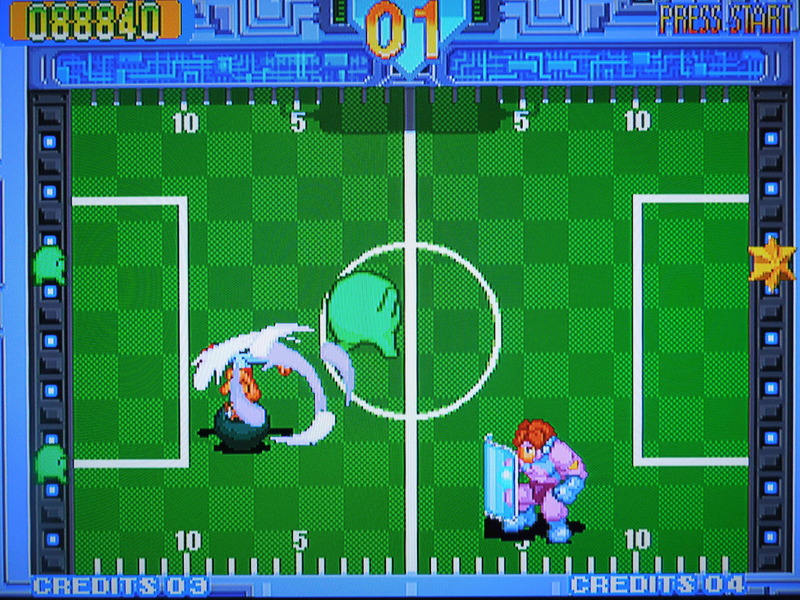 Saimon’s Trick Shot causes the ball to temporarily disappear, which is more useful when playing against another human than the CPU. The super shots of each character are all unique. Music and Sound Effects: There isn’t a lot of music in the game – the same song plays during matches, but it feels appropriate, if forgettable. A bizarre tune plays on the Continue? screen. The sound effects sound great – the ball bouncing off the walls, smashing targets, and being smashed by super shots all sound good. No complaints about the music or sound effects. Controls: The joystick moves your character in every corner of your side of the arena. Simply placing your character in the path of the ball will cause your character to deflect the ball with his or her shield. Pressing A when the ball gets to you activates your super shot – you can direct your super shot up or down by holding the joystick in conjunction with pressing A. Pressing B causes your character to slide in whatever direction you hold the joystick – this is a very useful way to get to the ball if it looks like you won’t be able to stop it from destroying your targets using your normal moving speed. Button C taunts your opponent, and pressing B + C activates a different taunt. Taunts are mainly for comedic purposes, but they do add 10 points to your score for every taunt you complete – you have to be careful though not to taunt too much while the ball whizzes right by you. Select pauses the game. The winning quotes are priceless. Order of opponents: No matter who you pick, you’ll face your opponents in this order: Stage 1: vs. Siren, Stage 2: vs. Saimon, Stage 3: vs. Mr. Justice, Stage 4: vs. Bloody Wolf, Stage 5: vs. Chinta Nemoto, Stage 6: vs. (Unnamed Boss). The Unnamed Boss is female, carries a large scythe, and looks to be a ‘Witch’ character, although she is not named at all. I didn’t find the last boss to be any more difficulty then the regular characters, although she can use any of the 5 selectable characters’ power shots, and does so often. The Witch seems to have not been ‘completed’ by the programmers. By this I mean that her lack of a name, the lack of a ‘versus’ screen before your match with her (you get the versus screen before the other matches), and the fact that your character doesn’t have a winning quote to direct at her (your character gives the same quote that they gave to Chinta Nemoto) makes me wonder if the programmers didn’t have the time to add these things before the game went out to arcades. The last boss (an unselectable character) can use all of the other characters’ super shots. Points: You get points for: breaking each of your opponents’ targets (different amounts are given every time you smash one – I’m not sure what determines the amount), going through a round without having any of your targets broken, successfully taunting your opponent, and how much time is left on the clock when you beat an opponent in each round. I have gotten over 100,000 points only once at this point, and it’s important to note that your Score Counter resets to zero once you continue -meaning you only have 1 Credit in which to set a high score – lose a match, and that’s it. This makes for a great 1 Credit challenge, however. 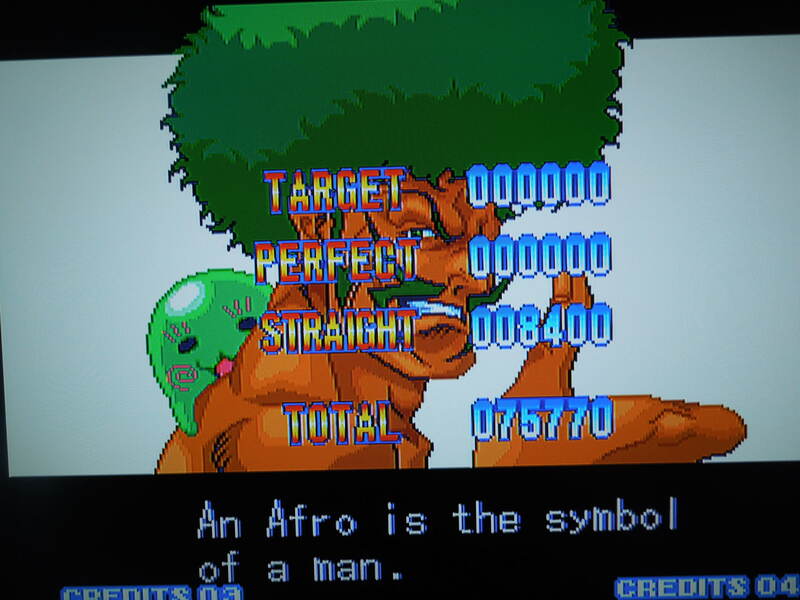 Interestingly, the high score screen on Battle Flip Shot requires you to get at least 250,000 points to even put in your initials (the game nor memory card would actually save your high score once you turned off the Neo Geo AES UNLESS you had a unibios installed – my unibios 3.3 saves high scores on most games but it’s so hard to get a high score on this game that I can’t confirm if it would save or not). Successfully executing taunts nets you 10 points, and some are hilarious. 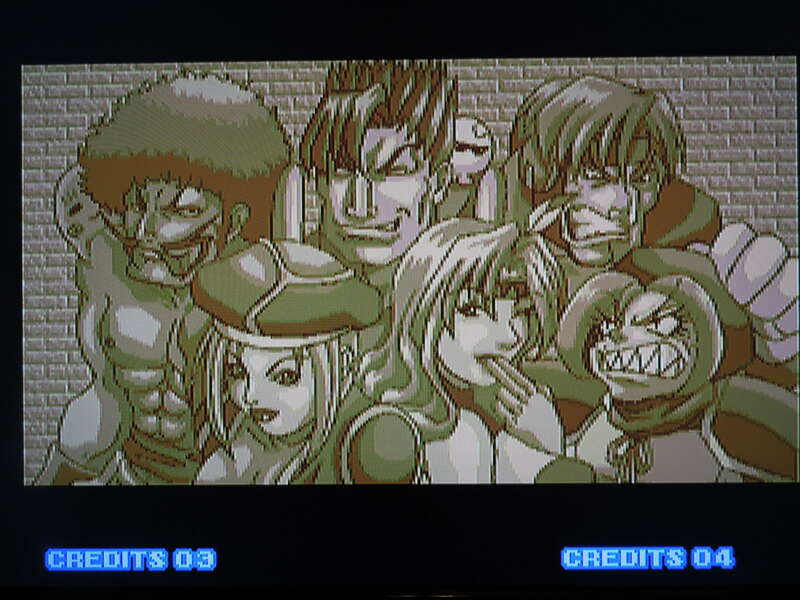 Difficulty: You cannot select the difficulty in this game the way you can in many Neo Geo AES games (probably because this game was only intended as an arcade release). Had I only played the game for a short amount of time, I would have described the difficulty as ‘Hard,’ but once I learned the game’s nuances, I would back that off to ‘Normal’ difficulty. Although the bouncing of the ball and destruction of your opponents’ targets can be a bit random, there’s no randomness to how well you play defense and protect your own targets – either you do it well or you don’t. Utilizing the slide move, directing the ball to the best of your ability, and knowing when to use super shots or when to simply deflect the ball – all of these elements play an important role in helping you win. Some opponents, like Siren, play aggressively (use super shots constantly) and can be a bit tougher, while others, like Saimon, rely more on simply deflecting the ball, and are easier to beat. Another thing I noticed is that sometimes your opponent simply mirrors what YOU do – if you don’t use a lot of super shots, then they won’t use a lot of super shots. If you use super shots on all the time, they’ll use super shots all the time. Battle Flip Shot is a flippin’ good time. Conclusion: Battle Flip Shot is an amazingly addictive, fast-paced game. 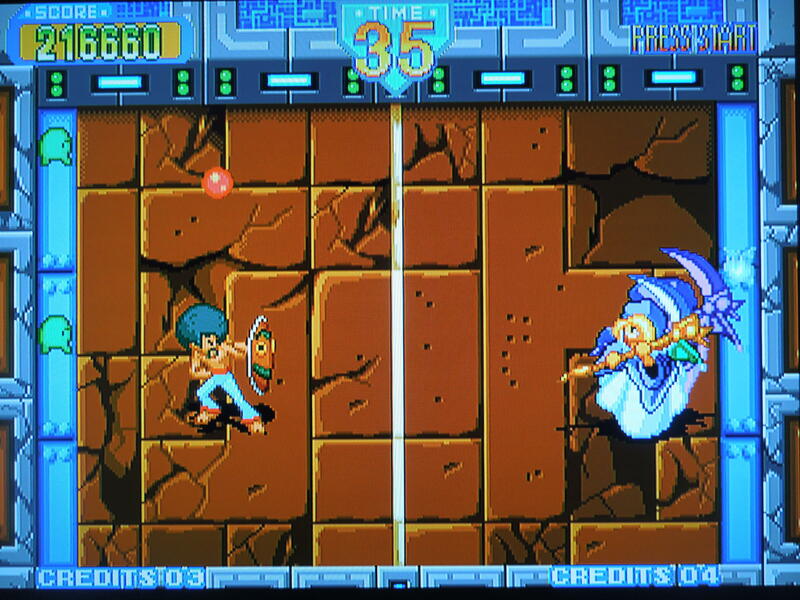 It is reminiscent of another Neo Geo AES game I reviewed, Flying Power Disc, although unlike that game, their isn’t as much diversity between characters in Battle Flip Shot. 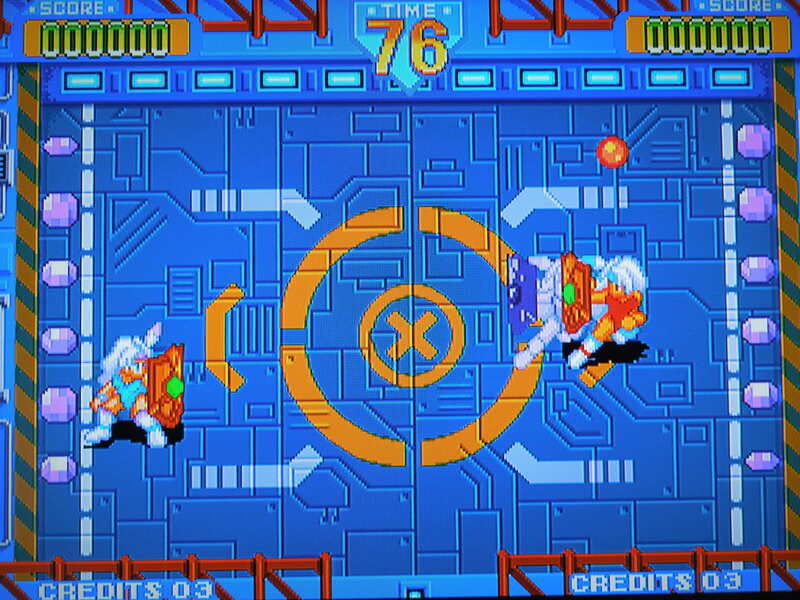 However, compared to Flying Power Disc, I prefer Battle Flip Shot – it’s simply more frantic and ‘non-stop.’ Playing with 2 players is great fun as well, and two players CAN pick the same character, by the way. The challenge of the game can be frustrating at first, but rewarding once you figure out how to play. Trying to beat the game with only the allowed 4 Credits is perfect, and will take time as you perfect your skills. This entry was posted in Neo Geo - Battle Flip Shot and tagged Battle Flip Shot Neo Geo Review. Bookmark the permalink.